Controversy occasionally can be the mother of success. This major luxury hotel project, where the developer's wife, Leona Helmsley, ruled as queen until her conviction on tax fraud, is one of the nation's most spectacular examples of the adaptive re-use of a landmark. The low-rise set of six connected townhouses, popularly known as the Villard Houses, four of which surround a large courtyard, were an official city landmark that were expensive to maintain. They comprised the largest portion of the site, which occupies almost half a full block between Madison and Park Avenues facing the rear of St. Patrick's Cathedral (see The City Review article) on Madison Avenue. Most of the townhouse interiors, all different, had been gutted and destroyed and reused for various office purposes over the years with the exception of the truly opulent Villard House that occupied the south side of the courtyard. 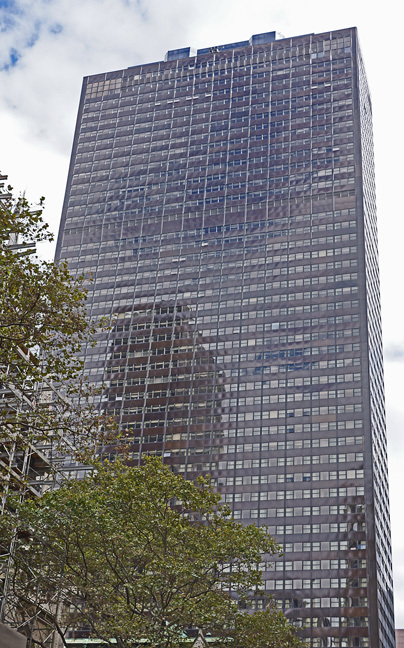 In the face of strong opposition from the city's preservationists to demolition of the townhouse complex, which was modeled somewhat after the Cancelleria in Rome, the developer, Harry B. Helmsley, decided to erect a 51-story new hotel tower behind them, but partly cantilevered it over the townhouses. That appalled many preservationists at first, but Helmsley, then the most powerful and most respected person in New York City real estate, was not insensitive and undertook a very impressive preservation project. At a cost of about $10 million, then a very considerable sum, most of the Villard interiors in the south wing were meticulously preserved including a large gilded, barrel-vaulted music room with murals by John LaFarge (see an illustration of it in another article in The City Review). The interiors of the Villard House are among the most sumptuous in New York. The lobby of the Villard mansion, entered directly from the courtyard, was a highly polished beige marble space, shown at the left, opening onto very lavish rooms and a very formal staircase with a delicate and exquisite wall clock by Augustus St. Gaudens. The splendid fireplace by the same great sculptor was removed to the balcony of the hotel's main lobby directly facing the courtyard. Its porphyry redness is almost swamped by the contemporary Baroque style of its much newer surroundings, but its majestic quality not only prevails but overpowers. The hotel's lobby spaces, shown below, are well finished with high quality materials that are not up to the par of craftsmanship of the Villard interiors, but respectably close. There are entrances from the courtyard as well as from both 50th and 51st Streets. Part of the lobby spaces have been redone, but the general ambiance is attractive and comfortable. The lobby has three levels all accessed off the grand staircase. The top level has a magnificent fireplace by Augustus St. Gaudens with flanking fish fountains, as shown below. The north side of the courtyard now houses several of the city's most prominent design organizations such as the Municipal Art Society, the Parks Council and the Architectural League of New York and its first floor contains major exhibition space and the Urban Book Center, one of the most delightful bookstores in the city. The hotel tower itself is, of course, a major disappointment because it is a bland, drab and pedestrian curtain-wall that looms high over the attractively repaved and landscaped courtyard. Of course, such an approach was almost excusable for the courtyard and its buildings are the prize and the tower merely the economic engine for their preservation, one might argue. A dark, sheer, reflective-glass tower would have been better, but the overall solution is handsome, which cannot be said of the atrocious bordello style of the guest rooms themselves, which are comfortable with wonderful views. Like much Italian Renaissance architecture, the exterior of the townhouses reveals little of the wonderful interiors. The multi-colored courtyard and a reinstallation of Bishop's Crook streetlamps on the sidewalk only add to the luster of this major project. The hotel scored a major coup in the mid-90’s when Le Cirque, the very fashionable and expensive restaurant announced it would relocate from its Upper East Side location into the public rooms of the Villard townhouse. The new restaurant is known as Le Cirque 2000 and its design was extremely controversial. Fortunately, it can be ripped out and it did not structurally ruin the spaces. Its intrusions are garish but whimsical, proof that expensive decor need not be tasteful, or good. On the other hand, one must applaud the daring and admit that the design would most likely work reasonably well in the Flatiron or SoHo districts. The restaurant's fame as a celebrity haunt, however, has not diminished and certainly its presence added considerable cachet to the hotel. A spokesman for the hotel said that public access to these great interiors would not be affected by the rather intimidating restaurant which is frequented by the "ladies who lunch." In 1995, the hotel created a very elegant outdoor cafe in the already handsome courtyard that is quite possibly the finest oasis in the city. The Helmsleys eventually lost control of the hotel, but it remains as perhaps their greatest legacy to the city. The Urban Center is a joy that should not be missed by anyone.